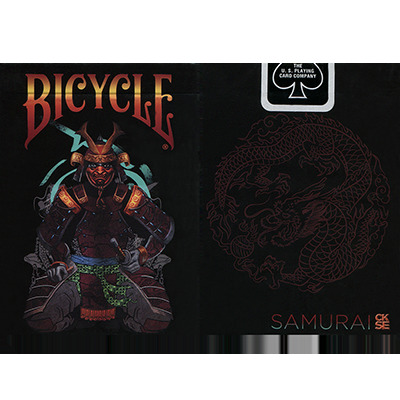 The special edition of the Samurai Deck. This striking tuck box features the elite samurai warriors in combat exemplifying the true way of the warrior. Illustrated in full-clad armor bearing samurai swords, a group of samurai is front and center on the back of this tuck box, with a gold contrasting dragon peering out from the borders. The reverse side features an intricate rendering of a samurai's face in shiny black against intercrossing gold swords and an ancient Japanese symbol.